The countdown of my all time favourite artists: 2017 edition. The official countdown of my favourite artists ever will start soon. I have compiled a list of 100 acts that are my favourites. This list is based on personal taste. It's not a ranking of the biggest acts of all-time (if you expected this, please leave this topic and go listen to Middle of the Road FM). It's based on who I like and what artists have touched me with their music. I'm nearly 30 years old, so expect a lot of artists that have been active in the music industry during that time. Expect pop, r&b, hip-hop, a little rock, some dance. After the huge success of Spice Girls and All Saints, Sugababes were the next big UK girlband to blow up in the year 2000. Their debut album 'One Touch' spawned their iconic hit 'Overload'. Three young girls, Mutya, Keisha and Siobhan, were ready to conquer the world with their post-bubblegum girlpop sound. Their debut sounded more mature than most material released by any girlgroup in the '90s. Their style was fresh and clean. The Sugababes were no glitter, nor glamour. They were three girls that looked just like the neighbour next door who just wanted to make good pop music. Unfortunately, a year after their big breakthrough Siobhan Donaghy decided to quit the band. Donaghy was later replaced by Heidi Range and the Sugababes 2.0 were born. I must admit the albums they released in the formation are my favourites. Both 'Angels With Dirty Faces' and 'Three' are great albums. Afterwards the Babes released a couple more of good singles, but I must say I lost interest when Mutya left the group, although I really liked Amelle. When founding member Keisha left, it all went downhill. The only good single they released in the last years was 'About A Girl', the song I still play a lot. Siobhan and Mutya both have released solo albums. I absolutely loved Siobhan's solo work (especially her debut, 'Overrated' is one of the most underrated singles of all time), I wasn't a big fan of Mutya's material. The song she did with Groove Armada, 'Song 4 Mutya', is stil pretty fantastic though. Wish she would've gone more pop/dance rather than R&B. In 2011 the latest formation of the Sugababes (4.0) split. Meanwhile the three founding members formed a new group 'MKS'. I believe they're still fighting to get the rights of the Sugababes name and brand back. MKS released one single: 'Flatline', which I think is fantastic and deserved much more success in the charts. Hopefully MKS will release new music soon. I would really like to have them back. Three sisters and their brother from Dundalk, Ireland decide to join forces to make beautiful music together. The Corrs released their debut album 'Forgiven, Not Forgotten' in 1995 and the record was a huge success. It's follow up 'Talk On Corners' was even more successful. With a mix of pop, rock and traditional Irish music the band scored hits with 'Runaway', 'Only When I Sleep' and a cover of Fleetwood Mac's classic 'Dreams'. For their third studio album 'In Blue' the band experienced with a more poppier sound. With success, because the record's lead single 'Breathless' quickly became one of their biggest hits. 'In Blue' also is my favourite album by The Corrs. I remember listening to it a lot when I was younger. The record's poppy, but has a mellow sound to it. I just really like it. The follow up to 'In Blue', titled 'Borrowed Heaven' was also great. 'Summer Sunshine' still is such an uplifting tune. After releasing the Irish-themed concept album 'Home' in 2005, The Corrs went on hiatus. Sharon and Andrea Corr released solo material and especially the latter delivered a good solo record with her debut 'Ten Feet High' that spawned the single 'Champagne From A Straw' - that still is such an amazing track. In 2015 The band came back with a brand new studio album 'White Light'. The comeback was a surprise and maybe not as successful as hoped. I do think 'White Light' is a solid album though and it's two singles 'Bring On The Night' and 'I Do What I Like' are great songs. The latter quickly became one of my favourite The Corrs singles. 09. Would You Be Happier? I liked a lot of Sugababes stuff back when they were around, though their stuff has aged rather poorly for me. The Corrs are someone I've always liked, and now since discovering more of their stuff, I'm enjoying them a lot more. I don't know many Sugababes songs. I've heard a few over the years - you can't very well escape them as a UKMix member for seven plus years - but they never really made a huge impression on me. A lot of what I've heard has been throwaway pop/R&B music. I do adore "Follow Me Home", though. That one is exceptional. I'll check out some of your favourites from that list. He's only released two full albums yet, but Ed Sheeran did make the countdown. The British singer impressed me with his debut his warm, soulful voice and songwriting skills. I thought his debut '+', released in 2011, was quite nice, but I was really impressed with the release of his sophomore album 'x' in 2014. Both albums, and especially the latter, are filled with great pop songs withj witty lyrics. That said - my favourite Ed Sheeran song comes from a soundtrack album. 'I See Fire' from one of the not so intersting The Hobbit movies ( ) is easily the best thing Ed's ever done. Ed is on the verge of releasing his third album and by the signs of the first two singles, the album will be another success. I love how he stays true to the sound of his debut, but tries to change it up a little every time. I think Ed is here to stay and will definitely have many more hits and successful albums. When Maroon 5 first came out with their debut album 'Songs For Jane' they delivered pop rock tunes like 'Harder To Breathe' and 'This Love'. Over the years Adam Levine and his bandmates changed their sound to a more poppier direction. 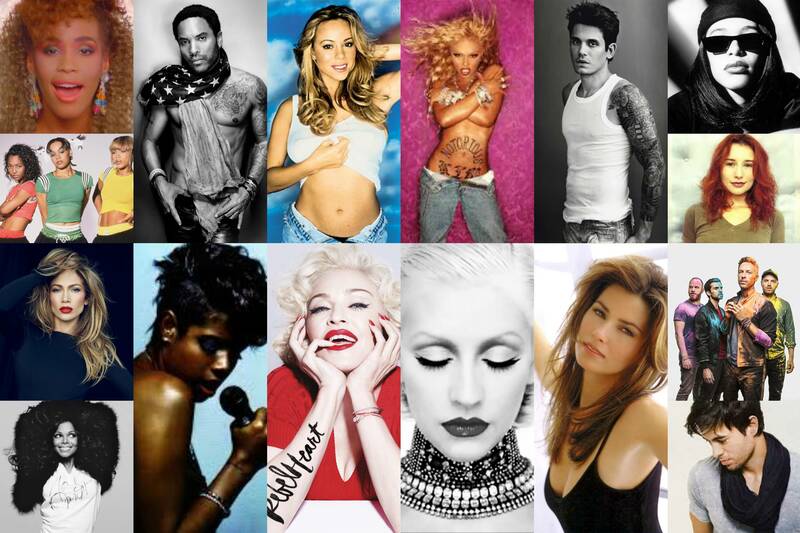 They started working with big pop stars like Rihanna and Christina Aguilera and left their rocky roots behind. A lot of fans were disappointed with the change of style, but personally I really like it. I basically like/love everything Maroon 5 has released so far. I think mostly because the songs are catchy and I really like Adam's voice. My favourite Maroon 5 song definitely is 'Moves Like Jagger' with the one and only Christina Aguilera. The song is one of their most pop records yet, but it's so damn catchy. Of cours Christina is a favourite of mine, but I think the song is a real classic and great hommage to the amazing Mick Jagger. I will probably never get tired of the song. It's hard to pick my favourite Maroon 5 album, because I think all their records are quite solid. I would say their debut is their signature album, but if I have to pick my favourite it would probably be 'It Won't Be Soon Before Long'. That said, their latest album 'V' is also a very good pop record which I think is very underrated. On their latest single 'Don't Wanna Know' the band teamed up up with Kendrick Lamar. An unexpected collaboration that worked out really well for them. I'm really curious to see what their net album's going to be like. I don't think the band will return to their rock roots anytime soon, so i wish they keep continue to release great pop tunes. I would really like them to work with Katy Perry one day. "Shape of You" is already the best thing Ed Sheeran's ever done in my books! Glad to see you appreciate "Thinking Out Loud", "Castle on the Hill", and "Everything Has Changed". Those are the other few I like from him. I like your M5 Top 20! Many of them would make up my top songs from the boys. When I first heard 'Just The Way You Are' I thought Bruno Mars was just another singer. I liked the track, but I didn't think Bruno could blow me away with his album. And then he kind of did. 'Doo-Wops & Hooligans' is such a solid record, really the perfect debut album. When he released other songs from the album, such as 'Grenade' and 'Count On Me', I knew I really liked this guy's music. Bruno's only three albums in, but I just know he's here to stay. With the release of his sophomore album 'Unorthodox Jukebox', my favourite Bruno record, he completely won me over. I feel like UJ is a little more dark and more on the edge than 'Doo-Wops' and that's probably why I like it so much. Also, Bruno's best track, -Locked Out Of Heaven - is on it. For now, this record is his peak for me. Together with the Mark Ronson collaboration 'Uptown Funk', that is. That song is a true classic. I must admit I was very excited about the third Bruno Mars album, but '24K Magic', even though I really like it, is his weakest effort for me so far. It's a solid record, but just not as good as his first two releases. I hope he will change things up with his next release. I'd also like to see him work with a female singer on a track for a change. I think he and Alicia Keys would create magic together, for example. Swedish pop rock band The Cardigans first caught my attention with the release of the super catchy bubblegum-esque single 'LoveFool', for the 'Romeo + Juliet' soundtrack in 1996. The song became an instant '90s classic and easily the biggest single of the band. 'LoveFool' is by far the most happy pop song Nina Persson and co. have released. Their discography overall is more gritty and darker. My absolute favourite The Cardigans album is 'Gran Turismo'. The album contains my favourite The Cardigans songs 'My Favourite Game' and 'Erase/Rewind', two gems that should've been as remembered as 'LoveFool', in my opinion. The video 'for 'My favourite Game' is one of the most simple, yet coolest I have ever seen. It's raw and out there. As a kid, I was only 11 years old when the video came out, I was obsessed with it. The song has so much energy, it's an anthem for being on the road. The albums released after 'Gran Turismo' were not as in your face, but still very solid. 'Long Gone Before Daylight' showed a more folky side of the band, while 'Super Extra Gravity' again had more of a pop sound. The lead single of the latter, 'I Need Some Fine Wine An dYou, You Need To Be Nicer', is another example of how diverse the band can sound. I always thought it was a huge shame the song didn't blow up, because it's super catchy. Lyrics are funny as well. After 'Super Extra Gravity', the band went on hiatus. Lead singer Nina Persson released some solo material and started a new side project A Camp. The material she released was alright, but nowhere as good as anything The Cardigans ever released. Ever since 2012 the band plays a few liveshows every now and then, but there's no word on new music. I truly wish they'd release at least one more album. I simply love Nina's voice too much. Ah, I love Bruno! Like you said, he's only three albums in, but I see a future legend in him. It's refreshing to see someone list "The Other Side" so high on his list of Bruno favourites. That one flies under the radar for most, but there was a time when I was addicted to it! For me, 24K Magic was on par with his previous releases, so Bruno's still three for three for me! I just hope he releases "Finesse" and "Versace on the Floor" as singles at some point. En Vogue was one of the first R&B groups (together with TLC) that I discovered. When I was just a little kid, I remember watching the videos for 'Free Your Mind' and 'Don't Let Go (Love)' on MTV all the time. I was too young to fully understand what their songs were all about, but I did love their edgy music videos. The video for 'FYM' was definitely one of my favourites, as they all looked so 'weird' (I was a little kid) and funky. Loved it. During the '90s En Vogue was huge, scoring hit after hit. My favourite En Vogue album 'EV3' (that album cover, I just love it) was released in 1996. That era provided us with their best material, in my opinion. 'Don't Let Go (Love)' is a song I can't ever get enough of. After the release of 'EV3', the girls released a 'Best Of' album. Then, in 2000 they released a brand new album 'Masterpiece Theatre', that spawned the amazing 'Riddle' single. The song was a huge flop in the US, but did quite alright in Europe. It was a hit in my country and I feel like the song was everywhere. It's music video (that you only can watch on Dailymotion in 2017) is another great one. It's such a shame the era ended after the release of 'Riddle', because I think the album is quite good. En Vogue's latest album 'Soulflower' (2004) was another solid record. It did feel like the band lost their edge, though. EN Vogue's new album, titled 'Electric Cafe' is expected to be released in 2017. A promo single 'Deja Vu' was released in 2016 and sounded quite alright. I would like to hear new material from the girls, but I don't expect anything as cool, fresh or edgy as 'Free Your Mind' or 'Riddle' anymore. I've liked a few Ed Sheeran songs here and there, he's definitely got the talent to stick around. Maroon 5 has had a lot of great songs, I tend to prefer their first four albums or so. Bruno Mars is another that has really shown diversity, I like how fresh he sounds and his new album is among his best yet. The Cardigans have had a few good songs over the years, "Lovefool" in particular is a 90's classic. Speaking of 90's classics, En Vogue had a lot of them! One of my favourite groups of the 90's. The fact that Natalia Kills is featured in this countdown might surprise a lot of people. Natalia is not well known for her chart hits, but this woman has delivered two great albums and a bunch of singles that I absolutely love. I still it's a shame she's not a bigger name at this point. I guess the lack of her popularity is because she's simply not very likeable. I dare to say she has a 'not very friendly' (to put it mildly) personality and attitude, but her music is just really good. Natalia released her debut 'The Perfectionist' in 2010. The album spawned the singles 'Zombie', 'Mirrors', 'Wonderland' and 'Free' as was later re-released with a new single 'Kill My Boyfriend'. The songs on the album are pure pop and produced by the likes of Fernando Garibay and Will.i.Am. In the beginning Natalia was very often compared to Lady Gaga, but I'd say Natalia's material is more edgy and darker than Gaga's. Especially the lyrics. 'The Perfectionist' was a solid record, but Natalia totally won me over with her sophomore album 'Trouble'. That songs on the album reflect a period in my life when I was younger and making bad choices. 'Trouble', for me, is an album about teenage tragedies, about coming of age and facing demons. 'Saturday Night', 'Controversy' and 'Problem' are just classic tracks. She really should've made it big with these songs. The album was released in 2013, but I still listen to it very often. The album brings back memories and still inspires me. After the release of 'Trouble' Natalia actually got into some trouble when she verbally attacked a contestant on -Factor New Zealand. The singer and her husband Willy Moon got fired and then decided to start a new 'band' together. The duo formed the group Cruel Youth and released an EP in 2016 titled '+30mg'. Natalia changed her name to Teddy Sinclair. aw, sad to see Taylor not making the Top 100. However, I also enjoy Maroon 5 ("Payphone" is their best song for me - still unmatched), Bruno Mars and I enjoy Ed Sheeran from times to times, too. Speaking purely in terms of vocals, there's no better girl group than En Vogue. "Don't Let Go (Love)" and "Free Your Mind" are stunning vocal performances. Natalia has some great songs (Wonderland, Free, Saturday Night to name a few) and her second album has some really strong album tracks. Overall, however, she's quite unoriginal and always seemed like a wannabe edgy pop star a la Rihanna or Gaga. And even before the whole X-Factor fiasco, she didn't feel likeable at all. Her new band is as wannabe as her solo career. Idk, I think she is capable of writing good pop melodies, but is unable to find her own identity. I still listen to her from time to time, her songs can be good for what they are, nothing innovative, but solid tunes.